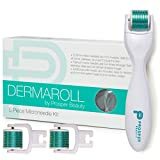 Micro needle therapy is a proven skin care therapy using a highly engineered device commonly called a dermal-roller or skin-roller, to regenerate the skin and improve elasticity and texture without damaging the surface of the skin. Clinically proven, and FDA approved, micro needle devices use approximately 200 extremely fine needles to penetrate the skin just enough to stimulate collagen and elastin production. This ultimately thickens the skin and aids in improving the look, condition, and feel. Micro needle therapy is a non-invasive and non-ablative treatment – meaning it does not damage the skin, but improves it. The treatment is effective for a wide range of conditions and skin types, such as wrinkles, acne, acne scars, rosacea, pigmentation, skin tone, enlarged pores and stretch marks, to name just a few. It should be noted, however, that different needle thicknesses should be used depending on the condition being treated – your licensed professional will know what needle is appropriate for your treatment. As the micro needle roller is rolled over the skin it creates micro punctures in the skin, leaving the epidermal layer (the surface of the skin) fully intact. The tiny punctures are perceived by the body as damage – this stimulates the release of collagen and elastin as the body works to heal itself. The roller will leave your skin thicker, as the collagen and elastin build, and ready for further treatment. By persistently triggering the healing process with repeated treatments, the body continues to stimulate the production of collagen and elastin until the desired results are reached. This process of skin remodeling can go on for months after each treatment, but noticeable results can be seen within a week. The skin naturally renews itself every 40 days, so with a little stimulation, changes can be dramatic and fast. Micro needle therapy can safely be carried out on all types of skin and all skin colors. While many other treatments often have to avoid sensitive areas – such as around the eyes, the neck, and the back of the hands – micro needle therapy can be used on all of these areas. The epidermis (surface of the skin) and melanocytes (pigment-producing cells) in the basal area (the area just below the epidermis), are not damaged, so there’s no possibility of inflammatory hyper pigmentation, which is good news for those suffering from pigment conditions, such as Melasma. Micro needle therapy can be even more effective when used in conjunction with therapeutic serums, lotions and creams. Even though the pores close within an hour after the skin has been ‘rolled’, this is enough time for the skin to absorb significantly more of the product and benefit from the infusion long after the application. U.S. and European clinical studies have shown that dermal rollers can increase serum absorption by as much as 1,000 times. Further studies have shown that micro needle rollers can be more effective than invasive treatments such as chemical peels, laser resurfacing, dermabrasion, and just as effective as non-ablative treatments such as Intense Pulsed Light (IPL), Co2 laser, and fractional laser.